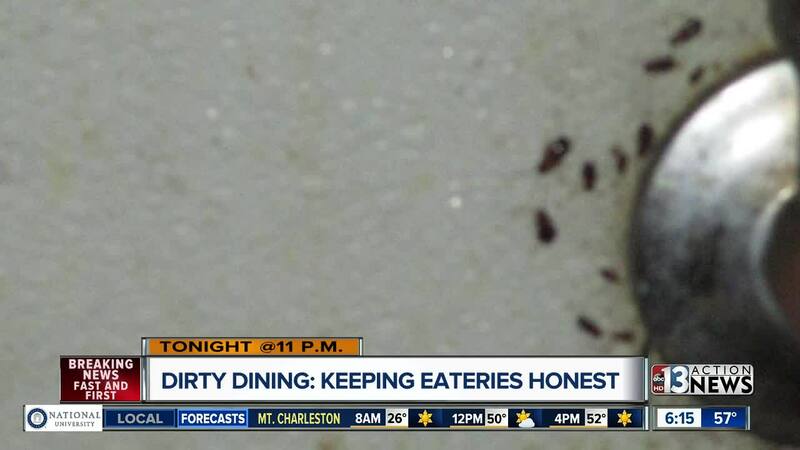 It's fitting in the Halloween edition of Dirty Dining that we've got things that creep and crawl -- roaches literally coming out the walls. It's a place where it started with a customer complaint about bugs on food and ended with the restaurant getting shut down. One customer's startling experience at the Sonic Drive-in on East Lake Mead Parkway in Henderson led to closure on Oct. 18. Inspectors confirmed an imminent health hazard -- gross unsanitary conditions including pest infestation. 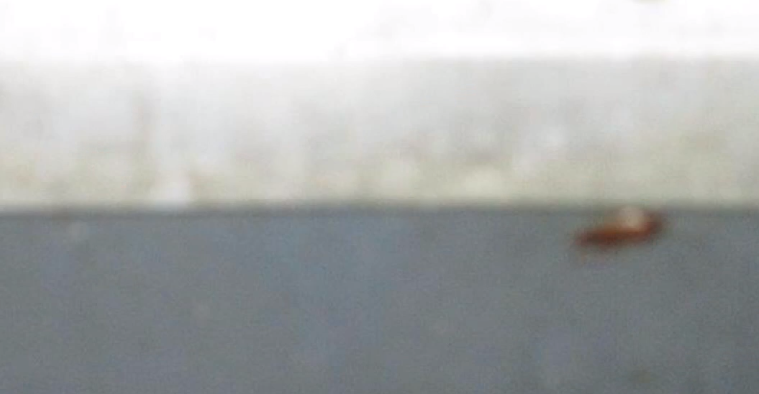 It all started with a customer who told the Health District they found a bug on their hot dog. The inspector who followed up found a large number of multi-generational cockroaches in the Sonic kitchen. No other roaches or pests were observed directly in food, but there were many around the water lines of the 3-compartment sink and elsewhere. That's despite pest control records from three days before the inspection that stated no pest activity was observed. In addition to the roaches, health inspectors turned up other violations at Sonic including pink mold in the chutes of the ice machine, food and other debris on the floor under equipment and a large amount of grease build-up on walls and floors, above the toaster and under the 3-compartment sink. The Health District required a deep cleaning before Sonic reopened October 20 with a zero-demerit A grade. When we arrived at Sonic to get their side of the story, they wouldn't talk, referring us instead to their headquarters in Oklahoma City. "Thank you for giving us the opportunity to respond to your inquiry regarding the Sonic Drive-in located at 1426 E. Lake Mead Parkway in Henderson, NV. The Sonic franchisee who owns and operates this drive-in takes employee safety and food safety very seriously. Following an inspection by the Southern Nevada Health District on October 18 that reported violations, the franchisee resolved the issues immediately. The drive-in was closed for 36 hours while management took corrective actions and then passed a follow-up inspection before reopening on October 20. Sonic works hard to ensure every guest receives a meal that has been properly handled and prepared, and that we have processes in place to address any food safety concerns. We take pride in being a good community partner, and we appreciate the trust and confidence our guests place in Sonic every day to serve them delicious and safe food." Another downgrade (38-demerit C grade) that resulted from a complaint came on October 18 at Don Michael's Italian restaurant on Lone Mountain and Decatur. The complaint alleged no sanitizer, improper dates on food items, food prep sink used to wash dishes and the owner washing wine glasses with fingers. The complaint went on to raise concerns about the hot water temperature, no handwashing between raw meat and other food prep, no gloves when handling salads for patrons, filthy floors, fryer and stoves and the cook putting a finger into sauce, then licking that finger to taste. The inspector found several items on the complaint to be accurate, but others were not seen. They validated improper dates on foods, prep sink used to wash dishes and filthy floors, fryer and stoves. Inspectors also found mozzarella expired in September still in use. They saw the cook put several cut rolls into the oven to warm bare-handed after doing many other tasks. Food was found at unsafe temperatures including chicken being breaded and soup left on the stove. There were dangerously high levels of chlorine in sanitizer that had to be diluted four times before it was safe. The sanitizer bucket was sitting on the prep table between the cutting board and thawing shrimp. Other violations included mold in the ice machine, dirty towels and apron left on prep counters and cutting board and cut up, used cardboard boxes placed into a container to absorb oil from Eggplant Parmesan after pre-cooking. Shelves and the reach-in cooler and freezer were extremely dirty, as were the deep fat fryer and prep shelves. The owner called to say he believes a lot of this traces back to a disgruntled employee. He says she had a key to the restaurant and believes she sabotaged the kitchen prior to the inspection. He added that all their customers are family and they work hard to keep things clean, but they appreciate the inspection process, always want to be in compliance and don't mind a shot in the arm when it comes to cleanliness. Don Michael's still has a C grade. They're working to fix a few more things before scheduling re-inspection. The main kitchen at Railroad Pass hotel-casino on Boulder Highway in Henderson was shut down October 17 after a complaint to the Health District about drains in the kitchen backing up every night. The complaint and the imminent health hazard were both found to be valid. The kitchen services the Iron Rail Cafe, the buffet and the steakhouse. All reopened on October 20 after the kitchen got its A grade back with zero demerits. The inspector saw sewage backing up out of floor drains onto the floor. They also found expired chicken salad. And deli meats, sausages, cheddar cheese, tomatoes and gravy all had to be thrown out due to unsafe temperatures. There was an unwashed avocado placed on top of black beans in the make table and the floor was dirty with excessive debris. "Shortly prior to October 17, 2018 a cast iron drain pipe underneath the concrete floor in our main kitchen collapsed. The kitchen was built in the 1970’s and serves three restaurants. The health inspector arrived on Wednesday October 17 and correctly required us to close the kitchen until the pipe was replaced. The arduous task of replacing the pipe was completed on a 24-hour per day schedule and was passed and approved by the Health Department on Saturday, October 20. The restaurants were reopened within hours. The other infractions in the kitchen were addressed immediately with the owner and the Executive Chef’s directive. We have reinforced our supervision relating to temperatures and label monitoring. The inspection passed, and our kitchen returned to an A grade rating. Naturally we are available to answer any questions or concerns of those interested in our efforts and procedures." All three inspections and subsequent action resulted from complaints. If you see something the Health District should investigate, click here to file a complaint .